Designed for larger enterprise environments, ScanGlobal 6.0 is the perfect solution for enabling digital scanning & imaging throughout all of your physician practices and office environments. ScanGlobal allows a single scanner in a network to scan directly to a remote server over your existing LAN or WAN. With ScanGlobal, imaging hardware on any workstation can be accessed by any software running on a RDP Terminal Service. 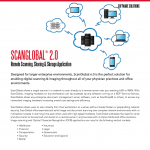 ScanGlobal allows any enterprise document management server software, such as ScanSharp® or others, to access any networked imaging hardware increasing overall cost-savings and efficiency. > NETWORKABLE – Quickly and easily scan, share and store images and documents over your IP / LAN / WAN network locally or among distributed offices. > ACCURATE – Combine with ScanSharp®, to recognize, transfer, and store images directly to a remote server. > EFFICIENT – Share a single network device with multiple users with no increase in scan imaging processing time. > COMPATIBLE – Use to network imaging hardware or “scanner” in your choice of network environments from RDP/Terminal Services. > WARANTY – Includes industry-leading 24-month warranty, maintenance and support.